The PediFix Soft Bunion Relievers™ are anatomically-shaped to fit comfortably between the first and second toes to help maintain proper alignment while reducing friction and irritation. The PediFix Soft Bunion Relievers™ are anatomically-shaped to fit comfortably between the first and second toes to help maintain proper alignment while reducing friction and irritation. Durable construction lasts for months. Helps make shoes more comfortable. 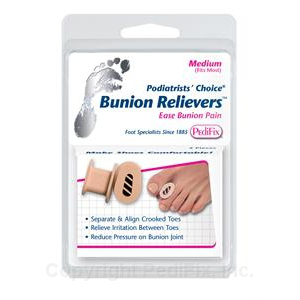 Simple relief for bunion pain & toes that rub.